Alleviating human suffering has been a part of dedicated services of Tirupati Tirumala Devasthanams to the man kind. To provide the most advanced medical technology to the needy, the T.T.D. 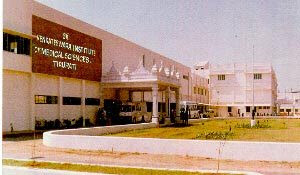 has launched a monument, a blessing from the Lord by opening Sri Venkateswara Institute of Medical Sciences, a sophisticated super specialty hospital at Tirupati.SVIMS was conceived in the year 1986 on the lines of AIIMS, New Delhi and the foundation stone was laid on 18.4.86 by Late Sri.N.T.Rama Rao, the Hon'ble Chief Minister of Andhra Pradesh in the world famous pilgrim town Tirupati. It was established with a view to providing Super Specialty facilities with nominal cost to the poor.The hospital started functioning from 26.2.93. by an Act of A.P. State Legislature. This Institute became a University in 1995 within a short time of establishment. The Present Director is Dr. B.Vengamma, D.M., (Neuro) (NIMHANS). The healing touch of SVIMS has covered most of Andhra Pradesh and the neighbouring states. The major objectives of SVIMS includes service, training and education in advanced medical sciences and technology. Latest technology in diagnostic wing and total computer automation of patient care has been implemented in this institution for the first time in our Country. The computer centre is equipped with medical literature analysis and retrieval system on line (MEDLINE) to get the information available from standard medical journals in the entire world. SVIMS also introduced "MEDLARS" awareness programme, which is a boon for all the students and medical personnel. Both inpatients &amp; outpatients have increased by 75% to 100% in recent years. Anaesthesiology, Anatomy, Biochemistry, C.T.Surgery, Cardiology, Endocrinology, General Surgery, Hematology, Medical Gastroenterology, Medical Oncology, Medicine, Microbiology, Nephrology, Neurology, Neurosurgery, Nuclear Medicine , Pathology, Physiology, Plastic Surgery Radiology, Radiation Oncology, Surgical Gastroenterology, Surgical Oncology , Transfusion Medicine and Urology. The Department of Cardiology possesses the state-of-the art biomedical equipment and a set of dedicated doctors and paramedical staff to provide a high quality treatment to its patients. It has an intensive coronary care unit with facilities for invasive haemodynamic monitoring, an echo-cardiography machine having biplane transoesophageal probe (along with facilities for colour flow mapping), several computerised ECG machines, a computerised treadmill machine, Cardiac catheterization and angiography, temporary pacemaker implantation, permanent pacemaker implantation and ballon atrial septostomy in neonates, have been done. The department is regularly doing coronary angioplasty and various valvuloplastry procedures. Radio frequency ablation procedures are the recent addition in catheterisation laboratory. The Department of Cardio Thoracic Surgery the state-of-the art biomedical equipment and a set of dedicated doctors and paramedical staff to provide a high quality treatment to its patients. The major achievements of C. T. Surgery department ever since its inception in SVIMS. is the versatility of operations being done here. The entire spectrum of surgical diseases of Chest are being attended to this institution. This includes Complex Cardiac Surgery, Simple Cardiac Surgery all forms of Thoracic Surgery, Chest trauma and all forms of Thoracic Endoscopies. The post operative management always received consultants level care. In Cardiac Surgery - Coronary Artery Bypass Graft surgery, all forms of valve surgery and all forms of complex congenital heart surgery in the very early months of life are being under taken. Many of the cases we have taken up are redo operations and are very sick ones some times denied of surgery in peer institutions. In that sense, for a new institution we have not shirked away from high risk cases as far as any form of Cardiac Surgery is concerned. We have also been actively involved in making our institute a model teaching institution. We have been co-operating actively with sister department. The Tirumala Tirupati Devasthanams brings one of the holiest of offerings ever Pranadanam - a scheme blessed by everything the Lord Himself stands for Sri Venkateswara Pranadana Trust aims at providing succor to the needy and suffering by offering them free and the best medical care at the T.T.D. run hospitals. The pranadanam scheme is aims at to providing free medical facilities to the poor patients affected with life threatening diseases of the Hear, Kidney, Brain and Cancer etc. The pranadanam Trust is launched by Sri.N. Chandarababu Naidu, Hon'ble Chief Minister of Andhra Pradesh in the month of Sept. 2001. So far we have successfully carried out 225 surgeries / treatment to the poor &amp; needy patients in and around Rayalaseema Region with 100% free of cost under this Pranadanam Scheme.The Institute is offering donations from the public Income Tax exemption under Section 80(G) to meet the expenditure under the noble cause of Pranadanam Scheme. The Institute is offering the services of expert surgeons of Dept.of Cardiology, Cardio Thoracic Surgery, Neuro Surgery, Nephrology and Oncology to perform the surgeries of the poor patients with free of cost in the name of Lord Venkateswara during your visit to Tirumala aiming with Manavasevae - Madhavaseva. 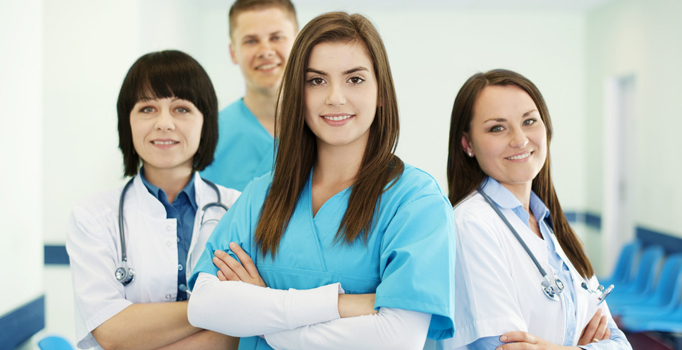 To create a centre of excellence for providing medical care, educational and research facilities of a higher order in the field of medical sciences in the existing super specialties and such other super specialties as may develop in future, including continuing medical education and hospital administration. To develop patterns of teaching in post-graduate level and in super specialties so as to set a high standard of medical education. To provide for training in para-medical and allied fields, particularly in relating to super specialties. To function as a referral hospital. To provide for post-graduate teaching and conduct of research in the relevant disciplines of modern medicine and other allied sciences, including inter-disciplinary fields of Physical and Biological Sciences. Dr. B.Vengamma successfully completed her MBBS during 1977-82 from S.V.Medical College, Tirupati and internship in 1982-1983. She completed her DM in Neurology in the year 1989 from National Institute of Mental Health &amp; Neuro sciences (NIMHANS), Bangalore and was awarded Silver Jubilee Award for 'Best Outgoing Student'. Dr. Vengamma was awarded Outstanding Doctor Award by Lion's Club, Tirupati and "Harish Chandra Bajoria Award" for social activities in the field of Epilepsy for the year 2004 by Indian Epilepsy Association. She pursued Mini Sleep Medicine fellowship of the American Academy of Sleep Medicine in 2009.Dr. Vengamma is the Founder President of Indian Epilepsy Association (IEA), Tirupati Branch and an active member of the branch. She is the Governing Council Member of IEA representing Andhra Pradesh since 2000.Dr. Vengamma worked as Assistant Professor &amp; Head of the Department, Department of Neurology at St.Johns Medical College Hospital, Bangalore and then worked as Specialist in Neurology at Alnamas General Hospital, Alnamas, Kingdom of Saudi Arabia from November 1995 to November 1996. Then she joined as Assistant Professor &amp; Head of the Department of Neurology in November 1992, later promoted to Associate, Additional Professor, became Professor of Neurology since April 2002 and then started D.M(Neurology) course in 2003. Institutional Ethics Committee is constituted principally for the purpose of checking whether proposals submitted for research (Ph.D./M.D./ M.S/ D.M/ M.Ch) degree of the institute meet established guidelines as also all research proposals submitted require clearance from the Ethics Committee of the Institute. All the research projects incorporate a section titled Ethical justification, for undertaking proposed investigative procedure/therapeutic intervention. Ethics Committee scrutinizes and suggests suitable modifications. All clinical trials of new drugs, new actions of existing drugs, and new invasive clinical procedures come under the purview of this Committee. This committee ensures actual implementation of the ethical guidelines and its specific recommendations during conduct of clinical studies. The clearance from committee is necessary even for projects that have been cleared by other institutions/agencies. For research on living animals, the Committee considers the possible clinical potential or substantial advance in knowledge from the proposed animal experiments. In order to full- fill the main objectives of this University to promote research in health and patient care areas which will at as an effective link between Health Care Delivery System &amp; knowledge in Health Sciences. The Library is mainly a reference library in the field of Medical and Allied Sciences and it is the largest medical library in the entire rayalaseema region and perhaps second in the state with all the infrastructure facilities along with latest medical books and foreign medical journals. Physiotherapy College is a recognized college in Andhra Pradesh by the Director of Medical Education, Government of Andhra Pradesh, Indian Association of Physiotherapy (IAP) and it is recognized as a one of the best college in India. 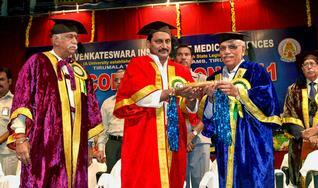 Sri Venkateswara Institute of Medical Sciences (SVIMS), Tirupati, established in the year 1993, under the aegis of Tirumala Tirupati Devasthanams (TTD), as a modern super speciality hospital, was granted the status of a University in the year 1995 by an Act of A.P. State Legislature vide Act No.12 of 1995. With the objective of raising this institute to the level of any major medical establishment in advanced countries, under the guidance of professional experts in administration and teaching, this 150 acre campus is gradually growing into a prestigious university. Today, SVIMS has 25 super / broad specialty medical departments, two colleges and two inter disciplinary departments and is developing into a centre of excellence for providing medical care, educational achievement and research activity of a very high order in the field of medical and other allied sciences including inter disciplinary fields of physical and biological sciences. In addition to these, SVIMS also provides training in paramedical and allied fields, particularly relating to super specialties. The SVIMS is recognized by the University Grants Commission under Section 12 (B) of the UGC Act, 1956, and the Medical Council of India has granted recognition for starting DM/M.Ch. Super specialty courses in Cardiology, Neurology, Nephrology, Endocrinology, C.T Surgery, Neurosurgery &amp; Urology and MD Courses in Anesthesiology, Microbiology, Biochemistry, Pathology, General Medicine &amp; Transfusion Medicine. The Department of Physiotherapy is rendering its services since 1993. The college of physiotherapy was established as an academic unit of the department of physiotherapy and is constituent college of SVIMS, Tirupati. Initially department started with 3 years of physiotherapy course and later upgraded with Bachelor in the year 1998, Master in 2003, and as a part of upgradation of staff, Ph.d is started in the year 2005. Direct experiences and learning by doing are the age old alternatives of passive learning being followed earlier. But learning experience infuses the objectives of inquisitiveness, expression, reasoning, application and appreciation scientific temper, spiritual inclination. Physical training, communicating abilities, vocational training and socio-cultural values are imbibed at college of physiotherapy, SVIMS. Physiotherapy is a science which is used to improve movement dysfunction, to promote the functions of human body and optimal health. It involves the maintenance, assessment, restoration of the physical functions and body performance. Physiotherapy is one of the most important rehabilitative services needed in a community. It is a vital therapeutic supplement of the medical profession, integral to the treatment of most patients. It involves the treatment of patients through movement therapy and other advanced technique like low frequency, medium frequency and high frequency currents, manipulations to joints, soft tissue manipulations, facilitatory and inhibitory techniques, motor relearning programmes, neuro developmental therapy, cardio pulmonary physical therapy, fitness programmes etc., to neurological impairment, cardiopulmonary dysfunction, gynaecological impairment , musculoskeletal dysfunctions physiotherapists also train the permanently disabled and handicapped people to make their best use of the abilities. Besides dealing with the preventive and remedial aspects of the disabled, they play a significant role in training sportsmen and in treating any injuries caused. Although a relatively new profession in India, the demand for physiotherapist in the country is immense, especially with increasingly sedentary life styles. As physiotherapist can treat a wide range of disorders, they are highly in demand today making carrier physiotherapy very attractive. Employment opportunities for physiotherapists are tremendous. A physiotherapist could be employed in the rehabilitation departments of hospitals, under the central and state governments, municipal corporations and private bodies, the Institute of the physically handicapped, medical rehabilitation centers, health institutions and defense medical establishments. Physiotherapists can also apt for teaching, while those with adequate capital can establish private clinics of their own. Future prospectus: currently there is a lot of demand for physiotherapists in the U.S.A, Canada and Australia. In India too the demand is rapidly increasing, it is estimated that one physiotherapists is required per 10,000 people. At present there are only 5,000 qualified physiotherapists so the demand for trained professionals can only be imagined. Moreover, the sedentary urban life styles and lack of exercise brings on a whole gamut or body aches and pains, which requires the assistance of specialized physiotherapists. The growing awareness of the role of physiotherapy can play in enabling the physically handicapped to lead productive lives has also increased the demand for trained professionals. Address: Sri Venkateswara Institute of Medical Sciences, Alipiri Road ,Tirupati-517 507, Andhra Pradesh ,INDIA.